Elle is an aeropilot willing to do a little smuggling on the DL if it means extra cash. When a French guy name Patrice asks her to take a box to England, however, she bites off more than she can chew and becomes embroiled in... can you guess? A CONSPIRACY OF ALCHEMISTS! I know I swore off steampunk novels the last time I read one (and the time before that, I believe), but I didn't really clue into the fact that A Conspiracy of Alchemists was steampunk until I started it. I thought it was going to be a fantasy about alchemists set in Paris. Alchemy and Paris goes together like hot dogs and mustard (except I don't really like mustard, but anyway--it's a metaphor). Seriously, there's an entire book written about how the statues on Notre Dame are actually modeled after famous alchemists. That wasn't this book, obviously. HOWEVER, A Conspiracy of Alchemists did start off really strong. I loved Elle and the setting, and the story was really fast-paced and interesting. Even the descriptions of the steampunky objects were less annoying than they usually are. 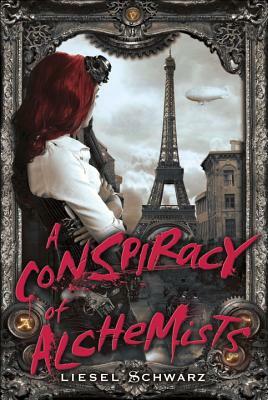 I was thinking this might be the first steampunk novel I actually liked! And then... the romance started. Anyone who knows me knows I love romantic subplots, but in the case of A Conspiracy of Alchemists, it was like hitting a brick wall in the believability department. It was SO. CHEESY. You see, in addition to the French guy, Patrice, there's an English guy who is 1. an aristocrat with 2. a dark secret, who 3. is kind of a jerk and pushes all the heroine's buttons. Yet she finds herself irresistibly attracted to him! Actually that wouldn't have even bothered me if I hadn't had to put with descriptions of his man musk and affecting stare and smirk, and everything else that I've read so many times I feel I could recite it. It was almost as if Liesel Schwarz wrote a steampunk novel and then took a generic Build Your Own Romance Novel template and just cut and pasted. No thought whatsoever! In addition, after a while the story started to fall apart and feel really random, like there was too much going on ALL THE TIME. At some point in a book you want the plot to become less important and the characters to engage your interest, and that just didn't happen in A Conspiracy of Alchemists. I think because Elle has to behave so illogically for the "romance" to work that her character lost consistency. In any case, I stopped enjoying it and got really bored. Alas and alack, yet another steampunk novel I don't get. But thank you to the publisher for giving me a copy to review!